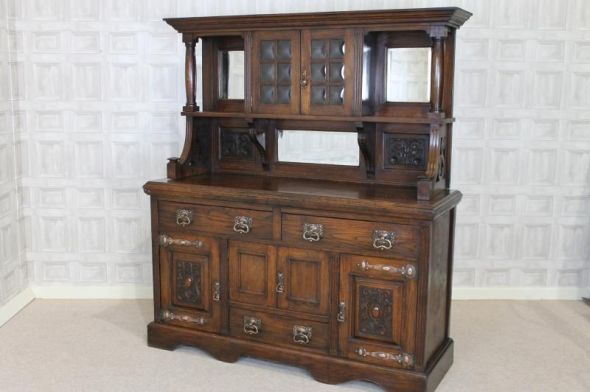 This English arts and crafts sideboard is a fantastic piece of classic English furniture. This large and impressive oak sideboard manufactured in the arts and crafts style features a glazed cupboard with bubble glass to top. This sideboard is surrounded by carved panels and fitted mirrors. The dresser top sits upon a large cupboard base. This item still retains all of its original brass and copper handles and strap hinges. It is in good condition for its age with just some general wear and tear. There are a couple of small blemishes to top as shown in the photographs. A substantial piece of arts and crafts furniture; ideal for any period property.